To answer a question on a previous post, no, there are not a lot of ways to resolve combat other than kill or be killed in D&D. It's a major flaw with the game, but in next week's post on The Horror-Hunter Ladder, you'll see why that's not such a big deal for the game. 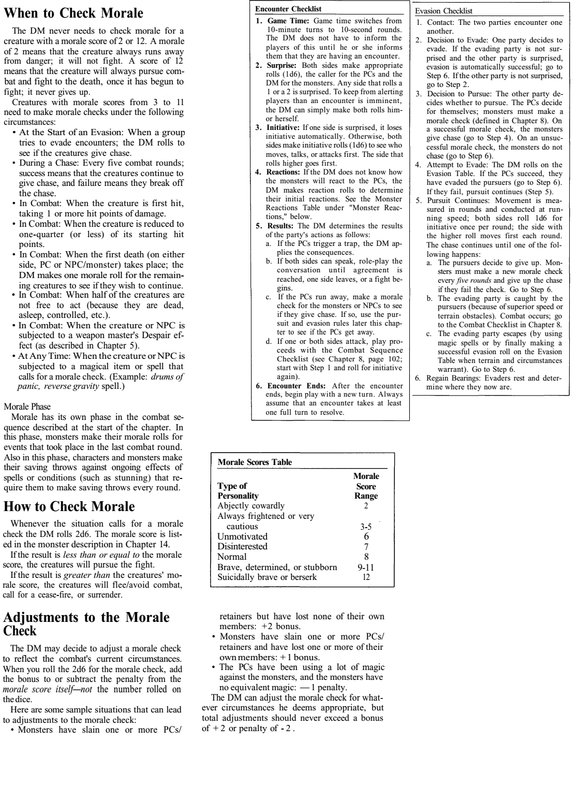 Click here for just a selection of the rules from original D&D's morale, evasion and pursuit system. From the Rules Cyclopedia edition (the one I cut my teeth on). This isn't everything. There are pages and pages of this stuff. The entirety of the 3.5 ed D&D evasion and pursuit rules. There are no morale rules in 3rd edition or Pathfinder's core books. I haven't checked their supplements. The upcoming Pathfinder Ultimate Campaign might have morale rules. I'll let you know if I see them. In round-by-round movement, simply counting off squares, it’s impossible for a slow character to get away from a determined fast character without mitigating circumstances. Likewise, it’s no problem for a fast character to get away from a slower one. 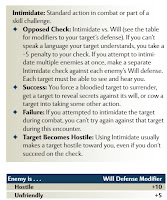 The 4th ed Morale system is under the Intimidate skill (Click for details). The word Morale does not even appear in the 4e monster manual. 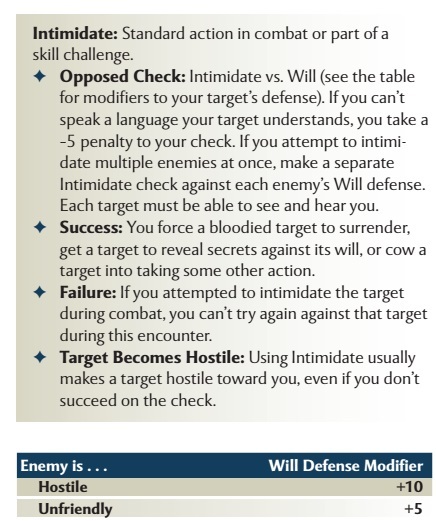 4e Evasion and Pursuit is handled as a skill challenge, which may be the most awesome way to handle it of all editions. Likewise, it’s no problem for a fast character to get away from a slower one. Boy, changing layouts really screwed up this post's formatting! Maybe I'll fix it someday.